Three month nickel closed Monday's trading session at $5.30/lb . Indicators at 6:30 am CST today show 3 month nickel trading around $.10/lb higher. Stockpiles of nickel stored in LME approved warehouses fell on Monday and started today just over the 381,900 tonne level. If you don['t think the pep rally at LME Week is working, you should look at the sea of red in commodities trading this morning - except for a patch of green in the base metals trading section. Nickel continues to be the belle of the ball, and we were surprised to see in the photo below, someone out there is apparently forecasting prices to fall. What? Nickel ends the month averaging $5.13/lb, up from an average of $5.10/lb in September. Looking at a chart of monthly average prices only, one might suspect the bullish euphoria of late summer and early fall, is starting to wane. But ,as Guy Wolf at Marex Spectron told LME Week attendees earlier, fundamentals do not matter and perception is very important. We appreciate his honesty. Looking at nickel stockpiles starting the last day of September to today's reading, we see the month of October saw a net gain of 36 tonnes. In other words, no change. Euro is quiet against the US Dollar, while the Yuan bounced late yesterday. Steel futures in Shanghai rose slightly, but remain well of their monthly high. Guy Wolf of Marex Spectron at LME Week - EVs will have an incredibly small impact on the nickel market in the very short term. .....But perception also more important- ie Indonesian export ban - because fundamentals dont matter for nickel.... In July-Aug, 64% of nickel liquidity pool on LMEselect were 1 lot trades, says Marex Spectron. Only 9% were 5 lots or more. Three month nickel closed Friday's trading session at $5.25/lb . Indicators at 6:25 am CST today show 3 month nickel trading around $.01/lb lower. Stockpiles of nickel stored in LME approved warehouses fell on Thursday and Friday and start the week just under the 382,900 tonne level. LME Week began today and metals trading is quiet in response. Nickel fell sharply on Thursday and Friday, and ended at its lowest in two weeks. 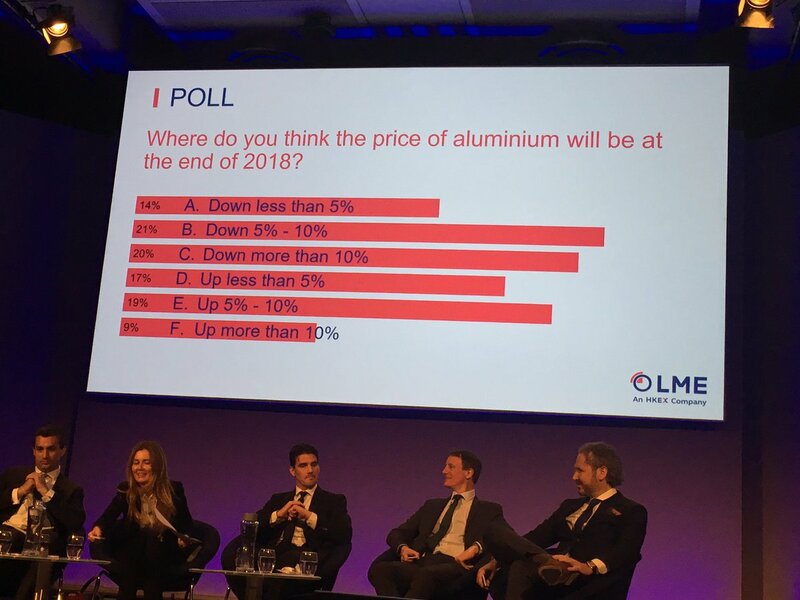 Based on what we are reading, nickel will be the bell of the ball this year at LME Week, as analysts try to figure to if all the EV talk will be as big a boost to the market as some have prophesied. Whether they prove to be true or not, the market appears to be betting on the rumors, with nickel averaging $4.43/lb for the first six months of this year, $4.77/lb for the third quarter, and $5.12/lb so far this month. As you can see two lines down, that is still lower than 2015 back, so there is plenty of speculation room left. Chinese steel futures were blamed for last weeks sudden dip, and if that is what the market is using as a gauge these days, then they are lower again today. The Euro and Yuan also fell against the US Dollar late last week, and neither are doing much recovering this morning. We hope you each have a profitable and enjoyable week. Bloomberg - The S&P Global Platts China Steel Sentiment Index slumped to 33.61 this month from 60.87 in September. The gauge is based on a survey of 75 to 90 China-based market participants including traders and steel mills. Three month nickel closed Wednesday's trading session at $5.38/lb . Indicators at 6:20 am CST today show 3 month nickel trading around $,02/lb higher. Stockpiles of nickel stored in LME approved warehouses fell on Wednesday and started the day just under the 356,000 tonne level. The $12,000/tonne level, once a psychological barrier, is starting to look like a technical resistant level, after traders have failed twice to maintain a traded price above this level. We still have resistance at $5.50/lb. The 10 day MVA is starting to catch up with the current traded price and that is worth watching as well. The Euro offered commodities some positive momentum yesterday, but nickel slipped. That support is waning today, with the Yen quiet this week. Lot of market news today, as well as a commentary by Reuters's Andy Home. India has slapped some more anti-dumping penalties on foreign stainless steel, with the US included among the penalized. It's been a good week for industry news and except for an internet glitch yesterday, we enjoyed linking to a lot of valuable information. This is our final update for the week, and we thank you for your visit and hope you have a safe and enjoyable weekend. 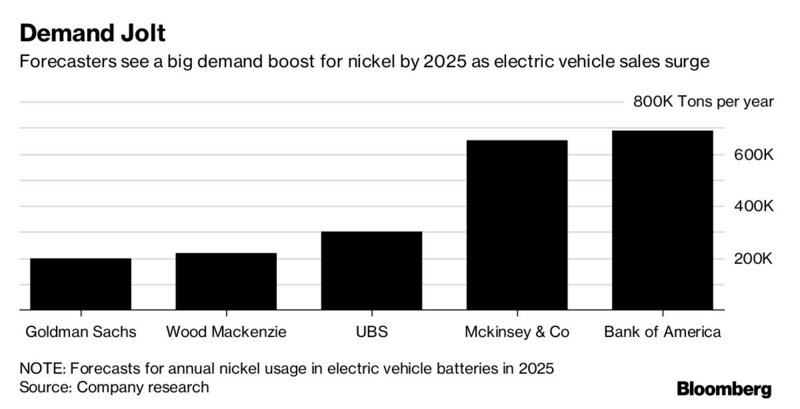 (Reuters) Growing demand from battery-makers will exacerbate "the predicted structural shortage of nickel between now and 2025," research house Wood Mackenzie said. Three month nickel closed Tuesday's trading session at $5.44/lb . Indicators at 6:25 am CST today show 3 month nickel trading around $.07/lb lower. Stockpiles of nickel stored in LME approved warehouses rose on Tuesday and now total just under 388,000 tonnes. More and more metals analysts are jumping on the demand to get out of hand band, thanks to the forecasted increase in EV vehicles. In the mean time however, nickel stockpiles are not falling. Stockpiles held in LME licensed warehouses started the year at 372,066 tonnes and after hitting an annual high last month at 389,148 tonnes, they sit just under the 388,00 tonne level today. So while the International Nickel Study Group announced yesterday we are looking at our third year of 'demand outstripping supply' for a third year in 2018, we caution our readers before taking the bait. The numbers are not there, yet. They may come, and if the EV industry catches fire, like so many hope it does, then we will see a large increase in demand. Whether the nickel market can keep up with that demand, 'as it is now', we will have to wait and see. We remain skeptical on how fast the EV market will catch on in the US, less so in Europe where high fuel prices could make the EV more attractive, and we were disappointed it did not play a larger role in China's new five year plan. The latter still could announce something big in the future, which has the capacity of making the nickel market take serious notice, but it hasn't come yet. The sky is not falling, so the Chicken Little's out there need to give it a rest. Nickel is backing off the psychologtical resistance level of $12,000/tonne today, but we see no reason for bullish traders to be concerned. (Reuters) Tangshan already required its steel mills, cement and other plants to cut output from Oct. 12, a month earlier than schedule. The production cuts will last until March 2018. Three month nickel closed Monday's trading session at $5.38/lb . Indicators at 6:15 am CST today show 3 month nickel trading around $.06/lb higher. Stockpiles of nickel stored in LME approved warehouses slipped on Monday and started the day just under the 385,300 tonne level. Nickel traded prices have seen a break from the US Dollar versus the Euro and Yen charts and while the latter are stagnant, nickel prices are on the rise again. After an unsuccessful test of the $5.49/lb test on Friday, price are approaching that level cautiously again. Technicals remain mostly positive. US stainless steel surcharges for November have been published and they are down from October (surcharge comparison here). The International Stainless Steel Forum report stainless steel production in the first half of 2017 was 5% higher than the first half of 2016. .The World Steel Association is announcing steel production in September was its lowest since February on China pollution cuts. Australia ocean watchers are issuing a La Nina Watch. Three month nickel closed Friday's trading session at $5.32/lb . Indicators at 6:25 am CST today show 3 month nickel trading around $.04/lb higher. Stockpiles of nickel stored in LME approved warehouses rose on Thursday and fell on Friday, and starts the week just over the 385,950 tonne level. Nickel got a little too exuberant on Friday, jumping to $5.52/lb in an attempt to test resistance, which held, and nickel collapsed back to register a loss of $5/tonne on the day. One metals firm blamed short covering on the sudden spike, but it tested resistance for about 6 hours, before giving up. Another unsuccessful attempt could send a negative technical signal to traders. As it stands, except for an overbought warning being sent by the stochastics readings, other technicals remain mostly positive. Lot of talk about production cuts in Chinese steel helping the market. 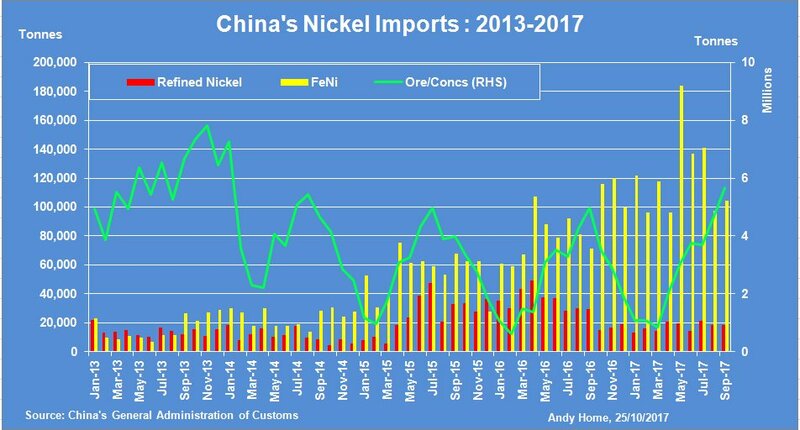 Really haven't seen anyone give a good reasoning on why cuts in steel production in China will boost demand for nickel there, but we can guess they are assuming if you taking Chinese pig nickel off the table, producers in other countries will be forced to turned to refined nickel. In our opinion, that is a pretty big gamble. The Chinese Communist Party ended its 5 year planning meeting with no gang buster announcement on a plan to switch to electric power vehicles. Hamza Khan, head of commodities strategy at ING - "Chinese crude steel output has dropped 4% month-on-month to 71.8mt in September 2017, and with winter cuts taking place, output could remain under pressure over the fourth quarter as well." Three month nickel closed Tuesday's trading session at $5.343/lb . Indicators at 6:25 am CST today show 3 month nickel trading around $.02/lb higher. Stockpiles of nickel stored in LME approved warehouses fell on Tuesday and started the day just over the 385,200 tonne level. While the US Dollar is trading mostly flat against the Yen and Euro, the commodity complex, as a whole, is a mostly field of red this morning. Nickel is bucking the board and is trading positively at the moment, but just barely. Top executives at Rio Tinto have been charged with fraud here in the States - jaw dropping news that has the industry paying close attention. China's Community Congress 5 year meeting is now in session, and will learn about and confirm the party's 5 year plan. As the single biggest driver for the traded price of nickel, industry experts will be watching the Congress' announcement's closely. The International Nickel Study Institute reported the world deficit rose to 6,700 tonnes in August, so with 385,200+ tonnes in LME trading warehouses, it will need to increase a whole lot more before the deficit in production becomes a price factor concern. BHP wants more nickel assets, and Vale wants a partner, or completely out, of its mega mine in New Caledonia. If the future outlook for nickel is as bright as some miners would have us believe, then a transaction should take place quickly. Three month nickel closed Monday's trading session at $5.38/lb . Indicators at 6:25 am CST today show 3 month nickel trading around $.07/lb lower. Stockpiles of nickel stored in LME approved warehouses fell slightly on Monday and started the day just over the 385,600 tonne level. Nickel is faltering this morning, but it appears to be part of a larger step back, due in part to a stronger US Dollar against both the Euro and Yuan. China's once every five years Communist Party Congress begins its meeting tomorrow and all eyes are turned to see if they come out with any surprises. Three month nickel closed Friday's trading session at $5.30/lb . Indicators at 5:45 am CST today show 3 month nickel trading around $.06/lb higher. Stockpiles of nickel stored in LME approved warehouses fell slightly on Thursday and gained most of the drop back on Friday, so our numbers are just under the 385,800 tonne level to start the week. Nickel is once again trading above its 10, 30 and 100 day moving averages, and trading at its highest since September 12th. The bull run last peaked out at $5.56/lb, so we could be trading at a new two year high this week. Another nickel ore ship has gone down. The Euro and Yuan are quiet so far, so they are neither assisting or hurting commodity traders. Copper is trading at its highest in 3 years, and this is helping other base metal trading. As a reminder, nickel is being boosted by multiple things. China steel production is up, while their so called pig nickel supply is being tampered by an attempt to cut pollution. This has been attempted on numerous occasions prior but the country seems to be taking the effort a lot more seriously this round. We also have the speculation that a worldwide shift to battery operated automobiles could seriously increase demand and push suppliers to keep up. It is hard for those of us in America to understand the potential for this market, but anyone who travels to Europe or Asia, understands that the potential for a real boom exists. Nickel, like nearly all commodities, operates on a cyclical boom and bust period. It has been five years since nickel traded at $20,000/tonne ($9.07/lb) and while there is no reason to speculate we could be trading there again anytime soon, an announcement later this week from China that they want to shift all personal vehicles to battery power within 10 years, could see nickel getting some serious attention. When was the last time you heard of anybody planning, building, or opening what we like to call a mega mine? This is what typically happens during a bust period. Hard to convince investors on the risk of building a new mine when prices have been low for so long. Yes there are current mines that could re-open and expand, but a true boom period eats up this extra supply and wants more. So no, we are not calling for a boom period on the near horizon. But one will come some day. For today, nickel stockpiles continue to run ahead of where they started the year, so much of what we are seeing in the market, is more speculation than based on any sudden tip n the supply.demand equation shifting. Earlier than usual update again today. Three month nickel closed Wednesday's trading session at $5.05/lb . Indicators at 6:20 am CST today show 3 month nickel trading around $.03/lb higher. Stockpiles of nickel stored in LME approved warehouses rose on Wednesday and now total just over the 385,800 tonne level. The Euro and Yen are just slightly off weekly highs this morning against the US Dollar, but not enough apparently to spook traders. We show technical resistance now at $5.50/lb, giving nickel bulls a lot of room to run. Most technical signals are sending positive signals. At least one scrap news source is reporting a glut of scrap metal in the US due to the recent wave of hurricanes. China's Congress will meet next week and watched closely for any notable changes in policy that might affect metals usage. Have a safe and relaxing weekend. Three month nickel closed Tuesday's trading session at $5.01/lb . Indicators at 6:20 am CST today show 3 month nickel trading around $.03/lb higher. Stockpiles of nickel stored in LME licensed warehouses fell on Tuesday and now sit just under the383,150 tonne level. The Yuan is trading slightly lower against the US Dollar this morning, putting negative pressure on nickel trading, while the Euro is stronger, adding positive support. Nickel was able to close for a second day above resistance yesterday, sending a technically positive signal to the market. AK Steel is pulling a head scratcher with customers, adding a monthly surcharge for graphite electrodes. With surcharges for fuel, metal ingredients, and even electricity, in place at some stainless steel producers, it makes one wonder what the next cost of business you have to figure into your cost structure, they will break out and charge you for. Keep whining about overseas producers US steel makers, because you are just making it easier for US consumers to justify looking that way. What's next - a purchase order processing surcharge? Three month nickel closed Monday's trading session at $5.00/lb . Indicators at 5:45 am CST today show 3 month nickel trading around $.02/lb lower. Stockpiles of nickel stored in LME approved warehouses fell on Monday and started today's session just over the 383,800 tonne level. Nickel is trading lower this morning, but that may not last, as the Chinese Yuan Renminbi continues to strengthen against the US Dollar. The Euro is also stronger today. We had resistance at $4.97/lb so nickel has one close above this level. Another close above this level today, could send a bullish signal to the market. Interesting article below from China about ordered cuts in nickel production. We are traveling today so our update is being published earlier than usual. Three month nickel closed Friday's trading session at $4.81/lb . Indicators at 6:25 am CST today show 3 month nickel trading around $.12/lb higher. Stockpiles of nickel stored in LME approved warehouses fell on both Thursday and Friday and started today just under the 384,900 tonne level. Nickel closed higher on Friday and with China returning to work today, the bulls are winning the tug of war. At the moment nickel has punched thru resistance, and has exited a narrow channel it has traded in since late September, If this trend can hold above the line of resistance for two days, we could see the market trend turn bullish again. At the moment, we are trading at levels last since on Sept 21st, yet well off early September highs of $5.72/lb. For those not using stainless steel and instead using galvanize coated steel, zinc is trading at 9-1/2 year highs. We encourage users of coated steel to consider the initial cost compared with the life cycle cost of stainless steel on your next project.It's Monday and another week awaits. May it prove profitable for you. FN - China's industrial production restrictions through the winter heating season are expected to impact steel production over the four key months by -34mt under a moderate scenario or -42mt under a worst-case scenario. This translates to around 30mt or 57mt of seaborne iron ore demand, respectively. Three month nickel closed Wednesday's trading session at $4.81/lb . Indicators at 6:20 am CST today show 3 month nickel trading around $.01/lb higher. Stockpiles of nickel stored in LME approved warehouses fell on Wednesday and now total just over the 387,200 tonne level. While too early to establish itself, it would appear nickel prices have moved out of one tight range, into another. The current range appears to be somewhere between $4.74/lb and $4.91/lb, up from $4.66/lb to $4.79/lb the prior week. Today after doing a big nothing yesterday, nickel continues to do just that so far today. This isn't surprising, with China on vacation this week. Without supply or demand issues to affect traders, we suggest watching the value of the Yuan as a guide for nickel. (Chart here) As you will notice, since July the chart is suspiciously similar to LME nickel prices. This is our last update for a slow week, and we hope you have a restful and safe weekend, and invite you back to what will hopefully be ,a little more informative next week. Three month nickel closed Tuesday's trading session at $4.82/lb . Indicators at 6:20 am CST today show 3 month nickel trading around $.03/lb higher. Stockpiles of nickel stored in LME approved warehouses rose sharply on Monday and now total just over the 387,800 tonne level. With China still on their week long holiday break, and the rest of the world seemingly on stand by, it is getting harder to find market news. Roy Cimatu was confirmed as the new Philippine Environmental Minister so nickel traders will be watching what actions he takes in the future. The DENR announced its review of mine suspensions announced by the former minister, should be complete by years end. Yesterday, the traded price of nickel did punch out of the tight channel it had been stuck in, but we are seeing very little follow through today - so far. Three month nickel closed Monday's trading session at $4.71/lb . Indicators at 6:00 am CST today show 3 month nickel trading around $.12/lb higher. Stockpiles of nickel stored in LME approved warehouses fell on Monday and started the day just over 382,700 tonne level. Nickel is testing $4.87/lb this morning, like it did Friday, after bouncing off $4.65/lb on Thursday. For now, that seems to be nickel's limited trading range, although today's attempt could force a break out - one way or another. Markets remain quiet as China continues its week long holiday. Three month nickel closed Friday's trading session at $4.76/lb . Indicators at 6:15 am CST today show 3 month nickel trading around $.04/lb lower. Stockpiles of nickel stored in LME approved warehouses fell on Friday and rose on Thursday and start the month just over the 384,500 tonne level. That is 4,308 tonnes lower than we saw September start at, but 12,450 tonnes more than we started the year at. After bottoming out at $4.65/lb for the later part of Wednesday and early part of Thursday, nickel recoverd somewhat on Friday. Today it is struggling again, but volumes are very low, due in large part to China's closure this week for multiple holidays. It should be a slow week on the nickel news front, and we really don't expect to see much out of pricing either.